Since the introduction of generic drugs in Brazil five years ago, the country’s pharmaceutical industry has undergone a transformation. Generic drugs have been steadily gaining market share and today represent 11.6% of total production. Their rise has led to a decline in the influence of major multinational drug companies that sell branded products in the domestic market. Generic drugs, however, are not the only danger confronting these multinationals. In an attempt to negotiate discounted prices, the Brazilian government is threatening to violate the patents on medications used to treat AIDS. That threat alone, say the multinationals, will lead big drug companies to reduce their investments in Brazil’s pharmaceutical sector. The story of generics in Brazil begins in 1996 with the passage of the Patent Law, which recognizes international patent rights over certain products, services and innovative ideas. Relying on this legislation, the Brazilian government decided to regulate the pharmaceutical sector, an industry known for its abuse of intellectual property rights. Indeed, Brazil had become a paradise for pharmaceutical fraud, including the practice of freely copying drugs without paying required royalty fees to the drugs’ manufacturers. In 1999, the government passed the Generics Law, which allowed companies to legally produce generic drugs that were perfect copies of patented drugs. The result was the introduction of generics into Brazil, a situation that clearly made Big Pharma multinationals uncomfortable. Relations between them and the generic manufacturers eventually stabilized, however, despite the fact that generic drugs had acquired a growing share of the market. During the third quarter of this year, generic manufacturers produced 11.6% of all drugs in Brazil, or 9.05% of the market in terms of dollar value. According to Raimundo, when generics first arrived, it looked as if the multinational pharma firms opposed them, but that wasn’t the case. “We were opposed to what was being sold as generics — namely, drugs that were similar [but not identical], and were being passed off as generics,” he says, suggesting that producers of similar drugs were hoping their products would be confused with generic drugs. Apart from differences between the players in the pharmaceutical market, generics are viewed in the academic world as an extremely positive way to democratize access to medications. The Brazilian government stresses that generics manufacturers must show that they behave within the “laws and rights” of the global economy. However, some actions by the government made the pharmaceutical sector uncomfortable. During the administration of President Fernando Henrique Cardoso (1995-2002), Brazil’s minister of health threatened to violate the patents on the drugs that make up the cocktail for combating AIDS. His goal was to lower the purchasing price of these products. More recently, the current government has adopted a similar strategy. For example, during price negotiations with U.S. manufacturer Abbott Laboratories, Brazil’s minister of health threatened to break the company’s patent on Kaletra, the anti-retroviral medication that is one of the components of the anti-AIDS cocktail. That threat was never carried out because Abbott ultimately agreed to lower the price of its medication by 46% — and distribute it free-of-charge to 163,000 of the 600,000 carriers of the HIV virus in Brazil. Although the government decided to preserve the patent intact, that confrontation could nevertheless prove harmful to Brazil. “Because of the continued danger that patents will be violated, employment in Brazil’s scientific research sector has dropped to about 20,000 from a total of 24,000 jobs in 1999,” says Raimundo. 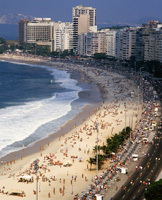 “Until 1999, Brazil was attracting annual investments worth about $350 million [in this sector]. In 2005, the figure has dropped to about $90 million. The investments are moving instead into Mexico, South Korea and other countries. Pharmaceutical research requires a great deal of money, a lot of people, and a lot of time.